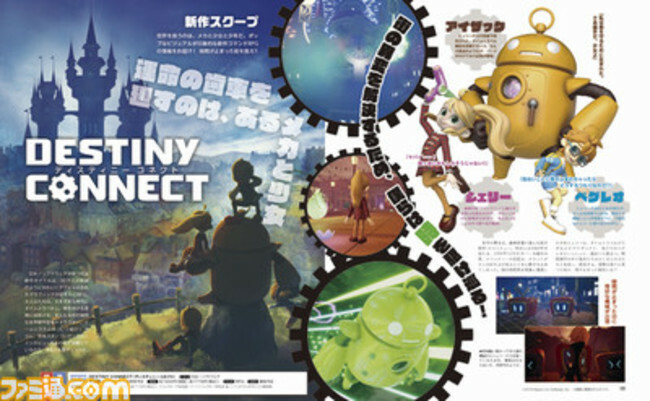 Nippon Ichi has revealed a brand-new RPG project, titled Destiny Connect. Although the Japanese official site will be grand opened next week on November 22, preliminary information about this new game is already available in the Weekly Famitsu magazine issue which has been published today in Japan. Destiny Connect takes place in Clocknee, a city famous for its business in producing gears. People in this city are also known for treating all items well - including old items - as they believe that "things that are treated well by people will have souls reside inside them." The date is December 31, 1999, and the city was preparing for New Year's Eve when time suddenly stops and citizens are not moving. The protagonist Sherry is one of the few people not affected by the time stop. In her father's room, she discovers Isaac, a robot that can perform time travel. Together with her friend Pegleo, Sherry uses the time travel feature to visit the past and future instances of Clocknee in order to find out what has caused time to stop in her current timeline. She will grow up as she meets a lot of people in the story. This new RPG will have a command-based battle system with symbol encounters, as the party fights against mysterious hostile machines that resemble things like television or telephone and move on their own. Turn orders will be determined by the speed stats of allies and enemies alike. As party characters gain experience from battles, they will eventually be able to use unique skills. Sherry - A girl brimming with curiosity, who lives in Clocknee. She really likes adventures and cute things, and when something interests her, she instantly goes into action to investigate it. Isaac - A robot found inside Sherry's father's room, which has a time travel feature installed into him. He seems to be close friends with Sherry's father, but his memory gets fuzzy due to some of his parts being lost. Pegleo - A boy who is Sherry's childhood friend, he is withdrawn and prone to worrying. He has extensive knowledge and is good at tinkering, but he often ends up getting swayed by the active Sherry. Save The Queen - A large department store where people can buy all kinds of livelihood items from home appliances, raw food materials, to general items. 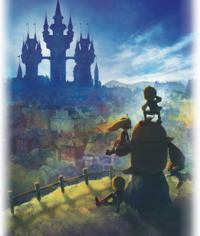 It is also a symbol of the Clocknee city which boasts a history of 1000 years from its establishment. Cafe Blossom - This cafe is run by Sherry's grandmother Linda, and it's famous for its excellent cherry pies. The retro and composed interior is another unique point of the cafe. Bacfarlane Collectables - A factory run by Bacfarlane, which handles maintenance of machines. Issac the Robot can also be customized at this factory. Gear parts can be set on him to raise his stats or even drastically change his battle style.